Crispy with just the right amount of salt. These are fries that you won't get bored of eating. I'm not going to lie. I wasn't one of those people that would turn up my nose at the crinkle cut fries, but these are much better. More potato-ey, if that's a thing. I'm convinced that they had to adjust the cheese fries sauce slightly to thin it out so it would adhere to the skinnier fries better without significant fry foldage from the weight of the sauce. On first glance it looked like they skimped on the cheese. But NO! The cheese was all there, it has just pooled in the bottom beneath the fry stack cracks. 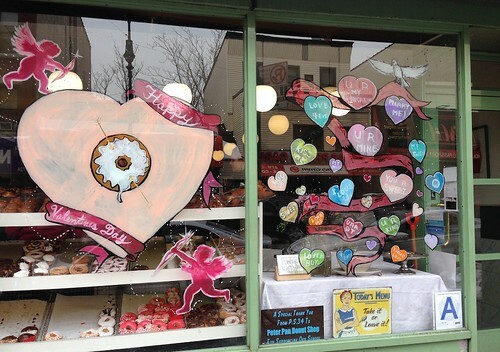 Get Your Love Something To Eat! Yes, Valentine's Day is on the other side of this work week. 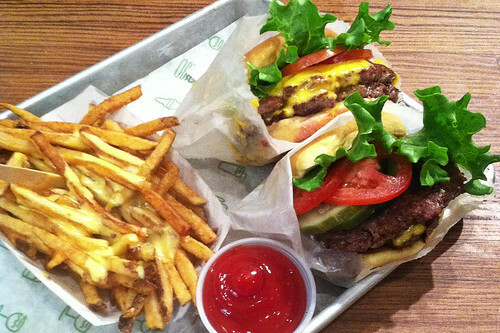 Don't worry if you still haven't gotten anything, I've got a list of delicious things to go with your, well, this. I'm basically doing all the work for you because I don't like it when my friends hand out uninspired gifts. I just threw up a little in my mouth reading those sayings. Anyways. First up, you can go to Peter Pan, buy some pink frosted doughnuts and binge your mutual ways through an evening "House of Cards" marathon. (Let's not mention that this is totally my plan for Friday.) Those not in Brooklyn and/or in need of chocolate gifts can head down to Essex Street Market or Forsyth Street for something from Roni-Sue's Chocolates. If you're not a true fan of their Valentine's picks, the ladies there can help you whip something together. Have someone who loves those sweet confections known as macarons? Well, then head to Macaron Parlour. These vibrant hearts showed up in my Instagram last night and even I got sentimental and lovey-dovey. Not here and need something for your honey in the city? 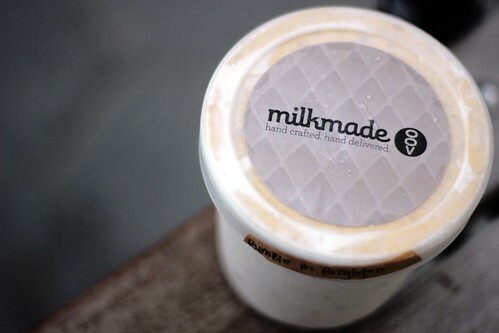 You can start by getting an ice cream gram from MilkMade! Two pints of ice cream--Salted Caramel & Red Velvet Cake--hand-delivered on Friday with a handwritten note (with your love saying, obviously). Also, perfect for that "House of Cards" binge. Want to get a whole personalized medley of things complete with savory items and bouquets because we all know you can turn this holiday into a weekend at home doin' thangs? Then order some groceries through Good Eggs. For those needing your favorite New York things somewhere else in the country, then Farm to People is your answer. Now no one has a reason to not buy your love, or me, something scrumptious. So...it's been a little snowy, huh? And maybe you're feeling kind of cooped up. Well, thankfully February offers an opportunity to celebrate two of my favorite food groups: hot chocolate and pancakes... First up, it's the annual Hot Chocolate Festival at City Bakery. Check out the calendar here. Caramel hot chocolate! Bourbon hot chocolate! Darkest dark hot chocolate! 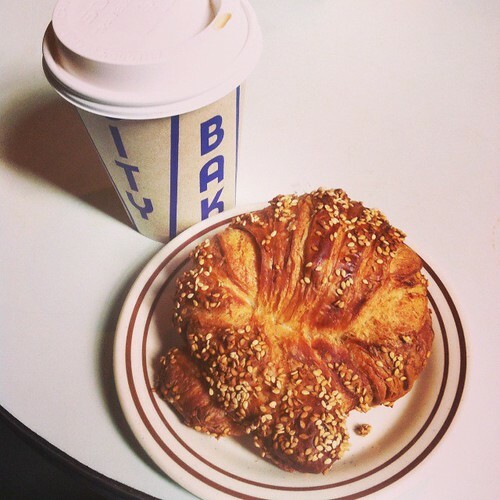 Grab a pretzel croissant while you're there! FYI, for newbies, The special pancakes are ONLY served Monday through Friday from 8am until 4pm and 6pm to 11pm. 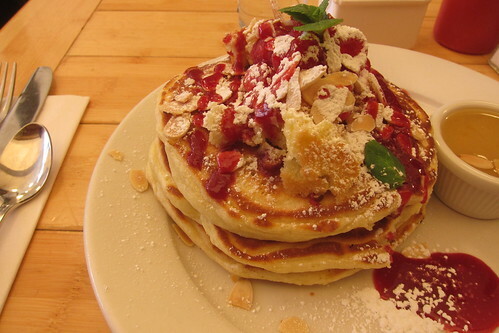 And if you're not a fan of the particular pancake of the day, they do have their famous wild Maine blueberry, banana walnut or chocolate chunk, with warm maple butter pancakes on their everyday menu. They only take dinner reservations for parties of six or more and if you're going with that big a group you'd definitely want a reservation to avoid a long wait for a table. I'll admit I'm a little sad that my favorite pancakes the candied orange peel, bittersweet chocolate pistols, and blood orange syrup didn't make the cut this year. But perhaps that will inspire me to concoct some at home. Right now I have my eye on the Swedish Apple Pancakes, how about you?